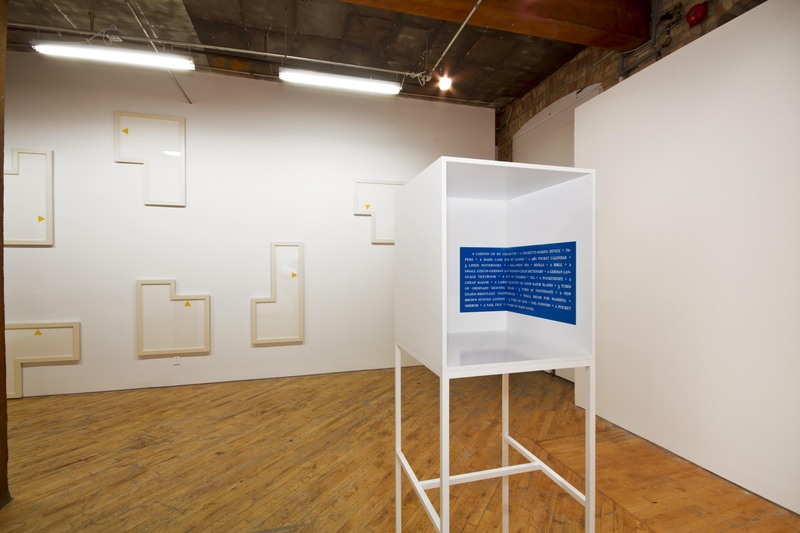 The three small rooms of Brian Groombridge’s retrospective at YYZ were unique and spacious precincts populated by words and numbers, signals and signs. Printed onto objects or positioned as titles, words in themselves seemed to take on the qualities of things, giving the term “printed matter” a new turn. Paradoxically, Groombridge’s few objects without texts or titles possessed something of the transitory or provisional qualities of words. The forms of two untitled painted aluminum sculptures from 2008 suggest “chair” and “radio” respectively, as if thought has retained its status as thought while having become precisely haptic, something you want to hold in your hand. The “radio” is composed of two small rectangles screwed together at a right angle. A circle is cut into the vertical. Its geometry and palette link it to De Stijl but it cannot be said to represent any precisely historical style. The “chair” is flat, about one inch thick. It looks like a criss-crossed, possibly modernist, diagrammatic cut-out. Projecting out from its blueness are three small square and rectangular plates: white, yellow and grey complications of flatness and chair-ness. Neither mobile nor stabile (to use Calder’s terms) it hangs still from the ceiling, by a wire. Its suspension is a matter of fact, and also a condition. Produced between 1989 and 2012, the works at YYZ evoke familiar forms and formats. A list of these might include the diagram, the measuring device, the museum alcove, the commercial sign, the trade show display device, the child’s game, the poem and the notebook. Here, the provisional and the quotidian, the props of something like daily life, open up into the more vast (though often no less quotidian) spaces of mind, memory and history. The “between” is important in Groombridge. It is a length of interior space that must be travelled before arriving at the totality of the works themselves (a totality, however, that is prone to flux). This work is named 50 06″ 0′ N, 14 15″ 0′ E. These are the geographic coordinates of the Czech Republic prison where Vaclav Havel was imprisoned. The list is his, made so that these items, corresponding to his own dignity and survival, could be brought to him by his beloved wife Olga Havlova. Groombridge lifted the exact list and its typeface from Havel’s Letters to Olga, 1988 (Faber &Faber). Groombridge’s is a third-generation approach to the idea of “escaping the frame,” an idea that so obsessed early conceptual art. Not only has the frame been physically returned to (as it was, along with the object, in Groombridge’s teacher, lan Carr-Harris’s work of the 1970s), but often it has become so integrated into the work that it ceases to call attention to itself. The largest room at YYZ was the most visually delicate of the retrospective, housing six works, including 50 06″ 0′ N, 14 15″ 0′ E, yet seeming close to holding nothing at all (Groombridge is, perhaps, the Richard Tuttle of conceptual art). Scattered at intervals and covering the long wall in this room was Tati, 2000, a work named after and mimicking the “animated gaze” of the French filmmaker Jacques Tati; a series of eight white, enamel-on-board, right-angled shapes framed in whitegeometrical units as if representing rooms, where each unit is marked with a pale, yellow triangle, an arrow-like sign indicating the direction of the represented gaze. Seemingly puzzle-like, the units are of different dimensions but take up playfully, precisely the same area. In Groombridge’s work, as in Tati’s, perception, in both of its primary senses, is key. Here, the white frames are borders between the known and the unknown, the empty space within the units, and emptier space between each unit. As in much of Groombridge’s work, one escapes the frame in the space of one’s perception and knowledge. These frames also have an anecdotal life. Tati’s family were frame makers, and Tati, it might be said, as a composer of film frames, followed in their footsteps. His camera rarely seemed to move, so as to admit the viewer into his busy set pieces, an effect of internal movement and external stillness that Groombridge’s work also encourages. E C Woodley is an artist, curator, composer and critic.